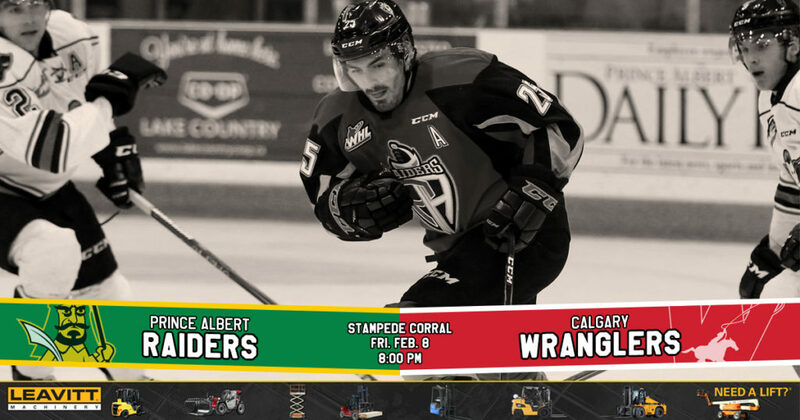 RAIDER REVIEW: The Raiders (43-7-0-2) and the Calgary Hitmen (27-19-4-1) turn back the clock tonight as part of the Corral Series at the Stampede Corral. Both teams will be wearing throwback sweaters dating back to the 1980s. The Raiders are coming off a 5-1 win over the Edmonton Oil Kings on Monday night at Rogers Place. Brett Leason led all scorers with a goal and two assists. Dante Hannoun also chipped in a pair of helpers. Jakob Brook, Cole Fonstad, Parker Kelly, and Ozzy Wiesblatt also found the back of the net for the Raiders. Ian Scott made 25 saves in the win as he reached the 30-win plateau for the first time in his WHL career. VS. CALGARY: Tonight wraps up the four-game season series between the Raiders and the Hitmen. The Raiders have won all three meetings so far this season, including a 4-0 shutout against the Hitmen on Oct. 8 in Calgary. CLINCHED: Due to the Brandon Wheat Kings’ loss on Tuesday night, the Raiders became the first team in the league to officially clinch a spot in the 2019 WHL Playoffs. This is the first time the Raiders have made the post-season in back-to-back years since the 2013 and 2014 WHL Playoffs. Also, Raiders are the earliest team to clinch a playoff spot since the 2012-13 season when the Portland Winterhawks punched their ticket on Jan. 30. SCOTT’S 30TH: Goaltender Ian Scott reached the 30-win plateau for the first time in his WHL career on Monday night against the Oil Kings. The Toronto Maple Leafs prospect is the first Raiders goaltender to reach the 30-win mark since Luke Siemens during the 2012-13 season. That year, Siemens finished with a 35-21-3-3 record in 66 games played. BROOK BREAKS THROUGH: Jakob Brook put an end to a 32-game scoring slump on Monday night with his third-period goal against the Oil Kings. Brook’s last goal was a shorthanded marker against the Regina Pats on Oct. 27. The Roblin, MB product now has five goals and four assists in 45 games during his rookie WHL season. NACHBAUR SUSPENDED: Winger Justin Nachbaur was suspended for three games prior to Monday’s contest against the Edmonton Oil Kings. Nachbaur is eligible to return for Wednesday’s game in Swift Current against the Broncos. NEXT UP: The Raiders conclude their Alberta road trip tomorrow night in Lethbridge against the Hurricanes at the Enmax Centre. Game time is 8 p.m. The next Raiders’ home game is on Friday, February 15 when the Brandon Wheat Kings come to town for a 7 p.m. start. Get tickets at raiderhockey.com and the Raider Office.